The recent innocent passage of USS Lassen through waters claimed by China in the South China Sea, billed as a freedom of navigation operation (FONOP) by the United States, highlights the inefficiency of US policy in the Asia-­Pacific. As has been widely reported, while the US government portrayed the voyage of Lassen through the waters around Subi Reef as a freedom of navigation exercise to challenge Chinese claims to those waters under international law, Lassen conducted an innocent passage, which would have been allowed even in territorial waters under the UN Convention on the Law of the Sea, and therefore not a challenge to Chinese claims. This compromised the US government’s stated goals for the operation. East China Sea (Mar. 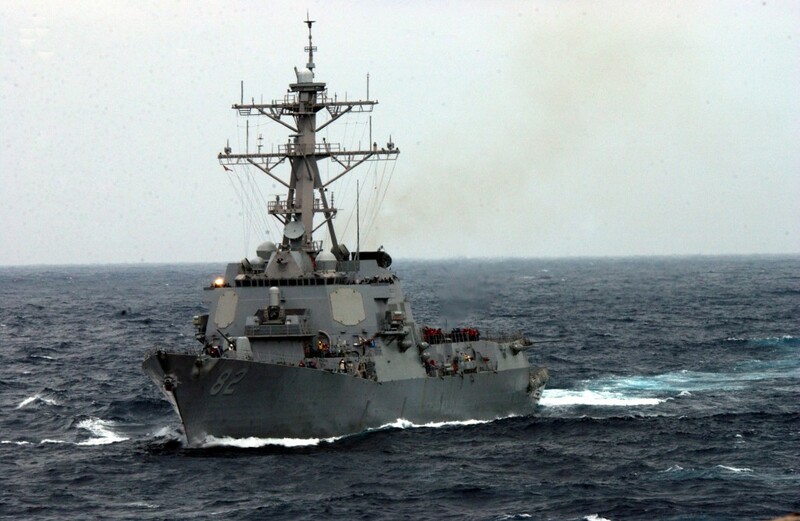 28, 2003) – The guided missile destroyer USS Lassen (DDG 82) sails through the rough seas. Lassen is part of the USS Carl Vinson Battle Group that just recently completed participating in the joint exercise FOAL EAGLE and is continuing a scheduled deployment in the western Pacific Ocean. U.S. Navy Photo by Photographer’s Mate 2nd Class Inez Lawson. This raises an important question of why the US intentionally compromised its objectives. It is unlikely that this was a result of neglect or ignorance, given the fact that everyone from officers on the ship to the Washington higher­ups who planned and approved the operation are familiar with international law and the protocol of an innocent passage. The most apparent intention of the US decision to conduct an innocent passage rather than a true FONOP is in an attempt to show restraint, and to avoid serious provocation of China. An important question, then, is whether the US, through its apparent restraint, succeeded in not provoking China. 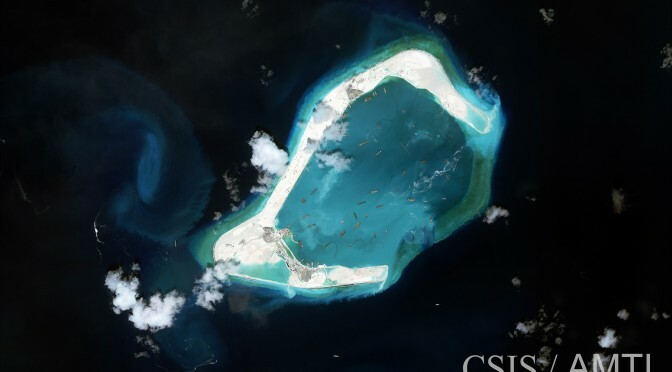 Subi Reef, a disputed land feature in the South China Sea, pictured in May 2015, and undergoing land reclamation to enlarge the island. Such activities have been a controversial development. (Source: US Navy). Furthermore, the actions and words of the Chinese government agree with each other. 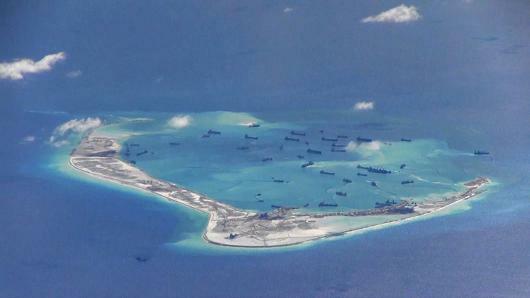 Even if their statements were posturing, the pace of Chinese militarization of the sea has quickened. This is clear from recent announcements of new missile deployments, a radar station, and the flight of fighter jets to the sea. The interesting thing about all these developments is that none were announced by the Chinese government. If China was stoking nationalist fervor in an attempt to please citizens who would have been otherwise inclined towards dissent as a result of the recent economic slowdown the Chinese government would have announced these developments itself, and loudly publicize them. However, given its initial decision to keep quiet, observers can reasonably infer that China’s recent actions are driven by considerations of power rather public opinion. This lends even more credibility to the Communist Party’s public statements. To an extent, the Chinese government has a point. If a foreign warship sailed within twelve nautical miles of US land, even if American claims to that land were questionable, most of the press and politicians of both parties would be outraged. A rough analogy is the Cuban Missile Crisis. The US had nuclear missiles in Turkey at about the same distance from the Soviet Union as Cuba is from Florida, but when Soviet missiles came to Cuba, there was widespread furor in America. Thus, it is questionable whether the FONOP could have been perceived as anything but a provocation. Yet the FONOP’s true goal (making a statement under international law) was compromised in an attempt to allay Chinese concerns. If it is impossible to avoid provoking China, but the US desires to make a statement, it should do so more vocally and less equivocally. If, to avoid confrontation, the US compromises the legal goals of the FONOP, there is little substantive argument for the FONOP to be carried out at all. This paradox reveals a fundamental problem with US strategy and policy in East Asia – committing to a strategy neither of engagement nor of confrontation is futile because such a strategy will inevitably be interpreted as a strategy of confrontation. The assets necessary for the current “neither ­here­ nor ­there” strategy ­­ such as warships, fighter jets, and the like ­­ can easily, in China’s view, be repurposed towards a strategy of confrontation and encirclement. President Obama’s “pivot” can be seen in the same light, because while it diplomatic on the one hand, it has significant military aspects. 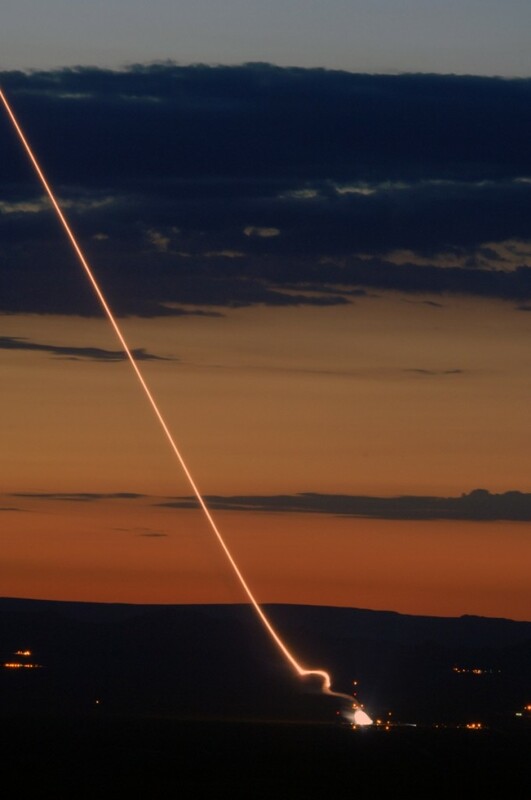 A test launch of the THAAD missile defense system. (Source: US Army). acquisition of the THAAD missile defense system. Whether China’s opposition is warranted is beside the point,­­ the fact is that it exists, and China considers THAAD to be an attempt to negate its capabilities, much in the same way that Russia considered a plan for ballistic missile defense systems in Eastern European countries to be a provocation, despite these defenses being plausibly directed toward Iran rather than Russia, leading to significant changes to the deployment of missile defense systems in Europe. The security dilemma is closely related to the Thucydides Trap, a dynamic taking its name from at the end of Book 1, Chapter 1 of Thucydides’ History of the Peloponnesian War, stating that the most important cause of war between Athens and Sparta was the rise of Athens’ power relative to that of Sparta, which the Spartans considered to be an existential threat to their city­state. The Thucydides Trap is often referenced in the context of US­China relations. While the Thucydides Trap is an example of the Security Dilemma, they are not exactly the same. The Thucydides Trap refers to relative shifts of the balance of state power, and the Security Dilemma, on the other hand, is usually used to refer to deployment of weapons systems, rather than state power in general. The distinction is precise, but it exists nonetheless. How, then, can the United States maneuver around the Thucydides Trap? 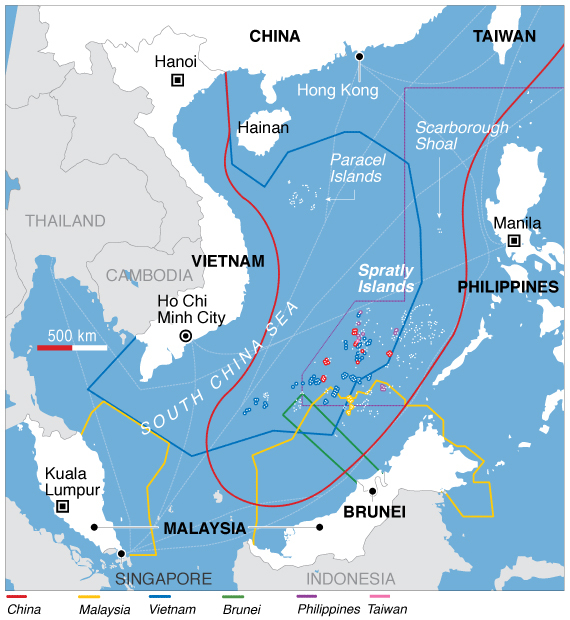 The current “neither­-here-­nor-­there” policy is probably not the best option, given the fact that tensions in the South China Sea continue to rise. A cursory analysis would suggest that America’s options are binary ­­confrontation or conciliation. But this would be oversimplifying the available options. State politics are not binary, there is a wide spectrum of possible actions (hence Clausewitz’s famous “War is merely the continuation of policy by other means”). A committed strategy of confrontation is not optimal, and even if it was, it would be politically impossible. A tack toward conciliation would probably require concessions on too many national security interests to be a viable strategy. 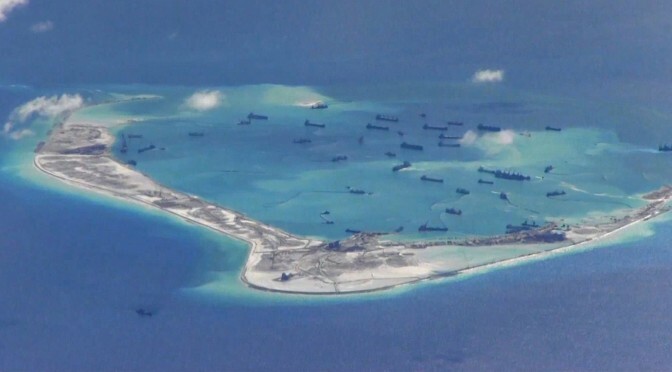 A better strategy would require constant communication with China about not only current developments in the area, but clarifications that US and allied actions are purely defensive in nature, rather than attempts at encirclement. Observers can reasonably conclude that such communication already occurs, but it should be stepped up. US and Chinese leaders should be in contact as close as US and Soviet Leaders were at the height of the Cold War. Many deployments by US allies and partners of defensive systems, such as THAAD, are in direct response to threats other than China (namely North Korea) so their deployment should be explicable to Chinese officials. The only place where a such a strategy of communication would fall short is where US and Chinese interests are in direct and irreconcilable conflict, as they are in the case of Taiwan. However, the status quo established by the Shanghai Communique, in which the United States acknowledged the One-China Policy and stated its support to a peaceful solution to the question of Taiwan’s status, seems to be acceptable to the US and to China, at least over the short­ to medium­ term, so barring the unforeseeable, this asymmetry of interests should not be fatal to a strategy of increased communication. While it is probably too late for the Obama administration to make a lasting initiative to rationalize diplomacy in the East Asian Littoral, this makes it all the more necessary for the next administration to have a clear vision, no matter what that administration’s party affiliation happens to be. Its vision must be not only clear, but decisive, because a strategy of both engagement and confrontation is not an effective way of pursuing either. A tack to either direction, but not to either extreme, is necessary. This requires an evaluation of US interests in the region. Of course, regional stability and safety of merchant shipping in the area are vital US national security interests, as is continued reassurance of allies. What all of this entails ought to be the subject of further discussion. More importantly, the US needs to envision and debate the status of other interests in the region, and the cost of achieving or protecting them. A strategy of increased engagement would likely require concessions on some non­vital interests, while a more confrontational strategy would entail significant risk. Either way, the current US policy has limited viability over the long term, and carries with it all the risks, but few of the benefits, of a more purposeful strategy. David Hervey is an undergraduate in his third year at Emory University in Atlanta, Georgia. He is studying Political Science and Economics, with research interests including political philosophy, low-intensity conflict, and the Asia-Pacific region.